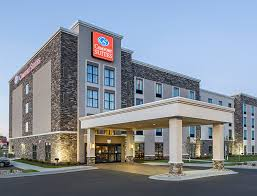 This new addition to the Hartville hotel landscape offers you a hotel designed to meet the demands of any traveler Completed in late 2014/early 2015, the Comfort Suites Hartville allows to you experience all the redesigns and renovations Comfort Suites has been dedicated to bring to travelers. The contemporary spacious suites feature a full-size sofa bed, microwave and refrigerator. Free internet access and recharge stations keep you powered up and connected. Wake up rejuvenated after a restful night’s sleep with our cozy bedding. 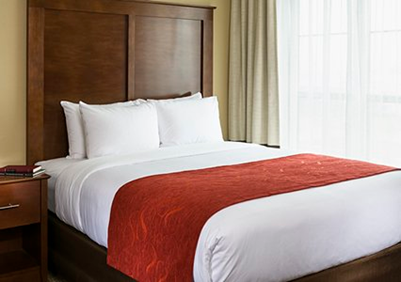 You’ll enjoy our soft sheets, plush pillows and soft filled blankets. Following your sound night’s rest, wake-up renewed for the day ahead with a free hot breakfast full of choices like eggs, sausage or bacon, fresh fruit, toast, Danish, juice and your choice of original or flavored waffles. The Marketplace offers you 24 hour access to purchase a wide assortment of sweet and savory snacks, cold beverages, ice cream, frozen dinners, sundries and medications while on the road.